Some days I want to be Italian, Spanish, British, Swedish, Norwegian, Dutch, Japanese, Chinese, American, Thai, Vietnamese, Greek, Lebanese, French or Israeli…Depending on the day. I want to fit in here, there and everywhere, sampling food as I go and speaking each language fluently. 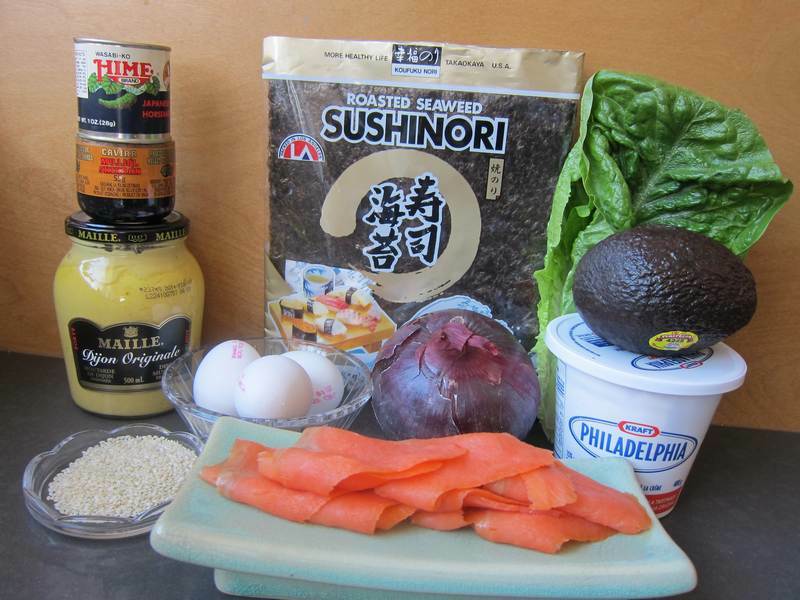 Perhaps today I feel a Japanese-Israeli slant coming on, and that is how Smoked Salmon Hand Rolls made it onto the menu. Arigato and shalom! Combine eggs with mustard and a little salt and pepper. Heat butter in a small frying-pan. Cook an omelet. Cool, then cut the omelet into strips. Lay down a sheet of nori, shiny side down. Make a thin line of wasabi at an angle, from one corner to the middle (see photo above). Add a thin line of cream cheese. 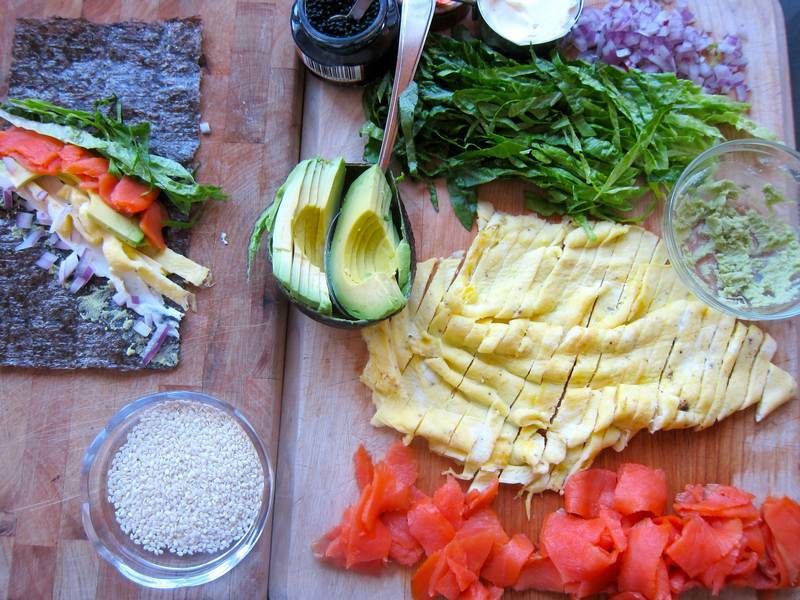 Add a portion of egg, salmon, avocado and red onion, all on an angle. 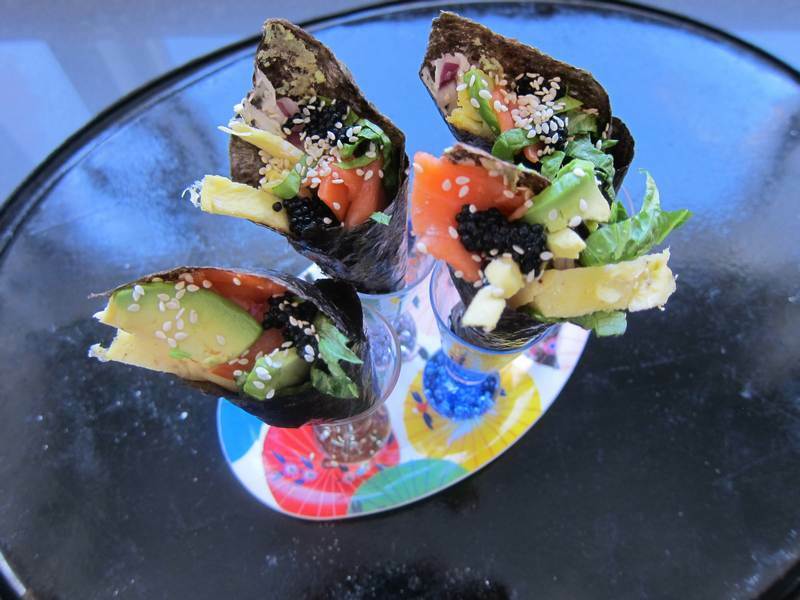 Roll the nori into a cone shape. Use a dab of cream cheese to seal the tip of the nori. Top the cone with a little caviar and a sprinkling of sesame seeds. Repeat with all the other nori sheets. Makes 8 handrolls, and serves 4. Say goodbye to bagel-bloat. These Smoked Salmon Hand Rolls are a nice light bite. For perfectly rolled, incredible sushi, try Mikado on Laurier. On March 17th I want to be Irish! Celebrate St. Patrick’s Day with a delicious green treat, coming up in the next Jittery post.